It's rained quite a bit over the last week, and my schedule hasn't meshed with my need to mow the lawn. 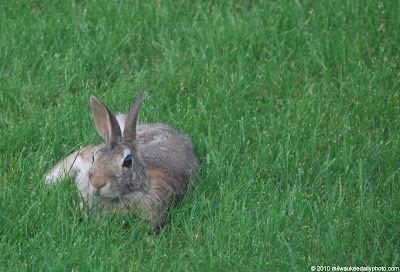 The neighborhood rabbits have consequently decided that the grass is high enough that it's safe for them to wander out into the middle of the yard and take their meals lying down. Hopefully the hay will be dry enough to harvest tomorrow. Adorable capture. He sure does look like he's enjoying lounging in the soft green grass. If you have flowers, I hope the rabbits aren't making a meal out of them.